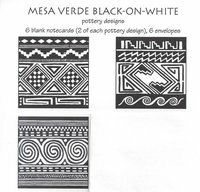 The Mesa Verde ceramic tradition featured black geometric patterns on a gray white background. Bold designs painted by the Ancestral Puebloans included interlocking spirals, stepped diamonds, narrow lines and checkerboard patterns. The three designs in this set present a selection of motifs seen on various pottery pieces, giving an overall view of a beautiful and very complex ceramic style. Includes six blank notecards, two of each design. 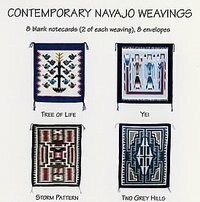 Each blank notecard in this set features a beautiful image of one of four different contemporary navajo weavings. Includes eight blank notecards, two of each weaving design. Textile identification with a short descripition appears on the back of each card. Packaged in a clear and reusable plastic box. Each notecard in this set features a beautiful image of one of three iconic Mesa Verde cliff dwellings. The set includes six blank notecards, two of each cliff dwelling. Site identification and a brief description appears on the back of each card. Packaged in a clear and reusable plastic box. This notecard set contains eight blank cards featuring illustrations of western National Parks "in the style of" WPA design. Between 1935 and 1943 the Works Progress Administration's (WPA) Federal Art Project printed posters of inspiring designs to stir the public's imagination for education, theater, health, sfaety, and travel. Share the joy and inspiration of the WPA style National Park artwork with a personalized message for any occasion. Many who visit this region plan their trips expecting to see spectacular landscapes preserved for their scenic value. Few leave disappointed but most return home enchanted, not by the scenery but by the human history of the ancient peoples who first inhabited this country. Includes 14 postcards featuring splendid photographs from the Southwest. This postcard packet may just be the best deal around. 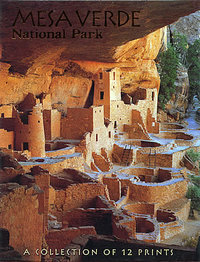 Included in this set are 12 postcards featuring the most stunning and iconic cliff dwellings found at Mesa Verde.